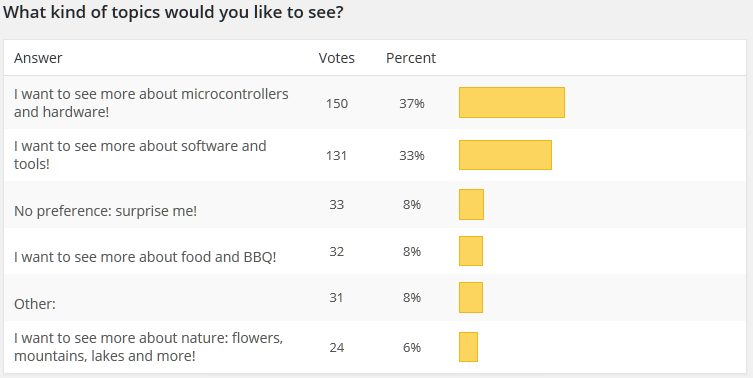 70% of the votes are for technical content (hardware, software, tools), and 14% votes are for ‘non-tech’ content (like BBQ, nature, etc). 8% leave it up to me, and 8% votes are for ‘Other’ with commenting on what they would like to see (more about the comments later). It is no surprise that most of the votes are for tech content: that’s why I have started this blog, and actually most of the articles are tech oriented anyway. I counted the ‘non-tech’ articles and they count for a total of 12% of the articles. So I feel I’m pretty much in range of the expectation of 14% for ‘food and nature’. So it looks the mix is about right: most tech, with some non-tech content from time to time. 💡 The interesting thing is that I receive many more ‘likes’ for the non-tech articles than for the tech ones? ⇒ Yes, absolutely. I started some projects around i.MX, so hopefully I can get some articles out about this topic in the near future. All the i.MX devices are definitely a ‘hot’ topic. Tools, techniques, tips, standard methods, recommended practices. ⇒ I admit that I wrote not much about methods/practices, but that certainly something to consider, thanks for the suggestion! ⇒ Same as above, thanks for the suggestion! ⇒ Yet another suggestion. I do cover some aspects in my university lectures, but I have not really covered that in my blog. Point taken. ⇒ Yes, I hear that a lot too. The challenge is that I explored advanced areas, and some of the later articles are not ‘basic’ any more. Need to start publishing again articles for newcomers. ⇒ I’m not sure about this comment? Should I write about engineering ethics? ⇒ The frequency of articles varies over time, and I do my best to keep the pace. I don’t think I can increase the pace. the mix oft food, nature and tech makes your blog so different and enjoyable! ⇒ Thanks! I enjoy different subjects myself, and my intend was giving all the technology a short break from time to time too. You forgot to put your bike photos. ⇒ Indeed. I did not had much time to take out the motorbike recently. ⇒ These are definitely hot topics. I’m working on a LoRa project so hopefully I can write about this soon. ⇒ Sure, I’ll give my best. ⇒ I have used Infineon parts a while back and somewhat got blindsided. Reminds me to check out their portfolio, so thanks for that! ⇒ We have used uCOS for educational purpose, but this has now been switched to FreeRTOS as well. I tried ChibiOS, but compared to FreeRTOS and its ecosystem it was not really an alternative. FreeRTOS is so small and easy to use, that I use baremetal only on the very tiny projects. Embedded Linux is something else I have my hands on, but for this there are so many good articles available, no need to re-invent the wheel here. What do you think about the “big green egg”? ⇒ I have seen it, and it is really a cool and interesting concept. Especially because in winter time the smoker is loosing too much heat, so the “big green egg” with its ceramic coating and insulation could be a very good thing to try. On the other end I love burning wood as part of the process, and using charcoal is not that much my thing. I might need to think more about this. ⇒ What I have started and what is only half baked is temperature controlled BBQ Smoker. I definitely want to do more projects which include 3D printing. Ideas about doing things different. ⇒ Not sure about this one. What kind of things? What I’m digging in for a while is debugging multicore on Linux (with FreeRTOS :-)) in a way that it does not need expensive software and tools. I consider that as ‘different’ as it seems that this does not exist yet. ⇒ Sure! Without open source and sources available, how can someone develop? ⇒ Used LPC devices a while back before moving to Kinetis. Ironically, with the Freescale and NXP merger both are now in the same company, so definitely I’ll touch LPC on newer projects. I like the Kinetis boards you use, but I’m also interested in the KE0x series. ⇒ I hope NXP support for the KE0x series will get better. At the time when I evaluated the KE series for 5V, there were only 3.3V ealuation boards available, so that opportunity evaporated. But as long there is no Kinetis SDK support for the KE series, I don’t think I can consider the KE series. ⇒ LPC is on my radar, and I started a NFC project too. IAR EW is something I consider only on the side: it is much less powerful than Eclipse and expensive. I like their compiler optimization, but GNU tools are more versatile and produce acceptable code size and code speed. What would be more interesting to write about is clang/LLVM. ⇒ That’s an interesting topic. My projects did not need such a thing, so I have not touched it. I don’t use Eclipse, so most of the software posts aren’t helpful to me. ⇒ To bad, and this blog has that as central theme :-(. To me, Eclipse might not be the best IDE in the world (but I’m convinced it is 🙂 ). The advantage of Eclipse is that learning it and investing time in it is very well spent, as pretty much everything out there in the IDE world is Eclipse based. ⇒ I try to avoid the term of IoT as this is overused and more a hype than ‘real’. But connectivity is definitely a topic to focus more. I’m using openHAB so I think I should write about this more. ⇒ giving my best to continue it. ⇒ I had started with an article about that, but then I think other places like git or GitHub have so many good material about how to use git, is it really worth to write about it too? ⇒ Yes, that’s a good topic. I cannot predict the future, what I can do is to write about how I’m dealing with this change. Be free to comment or follow up, I’m curious what you think. The survey indicates a general direction of ~80-90% technology content, with a mix of ~10-15% of non-tech article. In summary, I think I’m on the right track for that expectation, and should continue in that direction. And the ‘Other’ category gave me a nice list of things to focus on. Or let me know what you think! This entry was posted in Thoughts and tagged blog, Eclipse, FreeRTOS, Freescale, Future, Poll, Processor Expert, software, software project, survey, technology by Erich Styger. Bookmark the permalink. Also looking forward to the article about the MCU now! I think your current blog has about the correct mix of tech to non tech articles, I enjoy the wildlife blogs as it acts as a break / refreshing change (not so much the BBQ blogs as I am not personally interested in food / cooking). I would rather see more frequent blog posts as I enjoy reading the content you post but understand you have other commitments and appreciate the time it must take to write the blogs. I really enjoy reading your blog posts and cannot thank you enough for spending the time to write the articles, keep up the good work and thank you for the great content as it is much appreciated. thanks for your thoughts: and BBQ posts are more of a seasonal thing (altough I use it in winter time too). I’m still working on an control loop system for it, but I guess that would count more for the tech part. (though WordPress insists on most-recent-first, so you have to scroll and click through to the oldest post and back up). I’ve been thinking of doing some sound processing, but not gotten around to it, other than the posts for an ultrasonic sensor (https://gasstationwithoutpumps.wordpress.com/tag/ultrasonic-sensor/). I was hoping to do spread spectrum ultrasound, but I’ve not found a cheap transducer I can use. I have other projects on my to-do list, but they are low priority, as I really need to focus on my book for a while. I’d be interested in seeing some projects for the STM32F103C8T6 minimum development board, as that is about the cheapest ARM board around. Thanks for the link to the incubator project (I knew about it, but did not find it right away). The STM Minimum Development board is definitely very interesting. For now we are using the tinyK20 (https://mcuoneclipse.com/category/boards/tinyk20/) in that domain (small, tiny universal board) and it has the advantage to be used as debugging board. The price of less than $4 for that minimum development board is really, really attractive. Hi Erich. I think I missed out on this activity as I was busy. I would like to see more of the baremetal stuff in the mix, I love the interrupts topics you have been covering lately, its very essential. About OSes, http://nuttx.org/ looks interesting have you ever had a look? It seems to cover a broad range of controllers and processors. I also love your BBQ smoking stuff. Your cooked meat images make me go for lunch earlier than intended though 🙂 . All in all, great work and great references for my practical teaching material. Thank you. Ah, thank you, I have found a BBQ fan :-). I have explored NuttX a while back, but it did not really solve my needs. The challenge with NuttX (when I looked at it) was the number of devices supported, and the level of the device drivers. FreeRTOS for example is much smaller and more efficient (and does not require device drivers), and if I need something more capable than I directly move to an embedded linux variant, with the advantage of a larger ecosystem and I don’t have to learn a new system. Nothing wrong with ‘mid range’ systems like NuttX, but like MQX, eCOS and the like I see them crunched between small RTOS systems like FreeRTOS and larger systems based on embedded Linux. Again, these mid range systems are very valuable for many, it is just that they never were applicable to the classes of systems I had to build. Well said. I have never looked at embedded Linux, may be I should. I also think the need for device drivers in mid-range systems makes FreeRTOS more appealing. I will invest more time in FreeRTOS. Thanks again. Hello Erich. I want to start learning an RTOS and use it in my projects. I got to 2 choices. freeRTOS and chibiOS. which one do you recommend? and would you please talk more about chibiOS. I mean its advantages and disadvantages vs freeRTOS. thanks. I recommend FreeRTOS: it is more widely used, now under an even more permissive license, supported by and ported to all relevant silicon devices, according to surveys the most used RTOS for embedded devices, and best of all it has really great debug and trace support. Nothing wrong about chibiOS, but if you want to try out something outside the mainstream, why not? But then I rather recommend that you look at mynewt instead.